Crataegus monogyna, known as Common Hawthorn, is a species of hawthorn native to Europe, northwest Africa and western Asia. Other common names include may, mayblossom, maythorn, quickthorn, whitethorn, motherdie, and haw. This species is one of several that have been referred to as Crataegus oxyacantha, a name that has been rejected by the botanical community as too ambiguous. It is a broadly spreading shrub or small tree 5–14 m tall, with a dense crown. The bark is dull brown with vertical orange cracks. The younger stems bear sharp thorns, 1 to 1.5 cm long. The leaves are 2–4 cm long, obovate and deeply lobed, sometimes almost to the midrib, with the lobes spreading at a wide angle. The upper surface is dark green above and paler underneath. The hermaphrodite flowers are produced in late spring (May to early June in its native area) in corymbs of 5-25 together; each flower is about 1 cm diameter, and has five white petals, numerous red stamens, and a single style; they are moderately fragrant. They are pollinated by midges and later in the year bear numerous haws. The haw is a small, oval dark red fruit about 1 cm long, berry-like, but structurally a pome containing a single seed. Haws are important for wildlife in winter, particularly thrushes and waxwings; these birds eat the haws and disperse the seeds in their droppings. 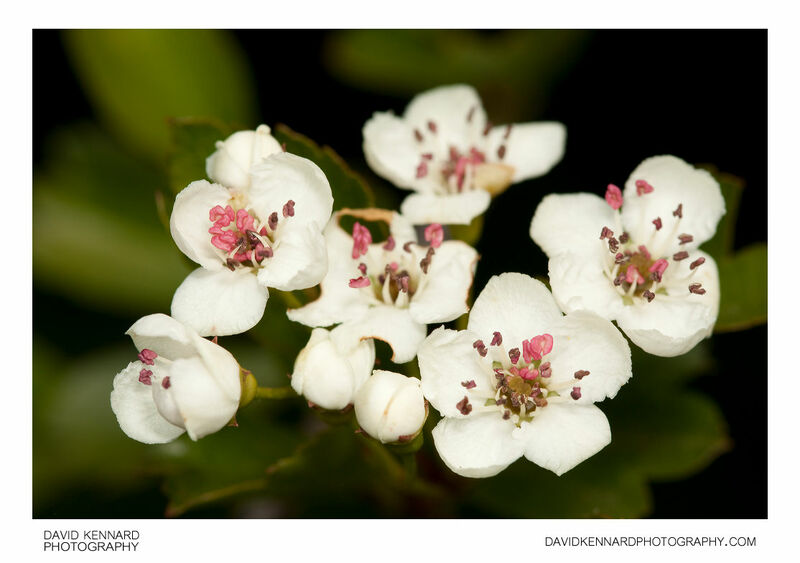 It is distinguished from the related but less widespread Midland Hawthorn (C. laevigata) in the leaves being deeply lobed, with spreading lobes, and in the flowers having just one style, not two or three. However they are inter-fertile and hybrids occur frequently; they are only entirely distinct in their more typical forms.